This FAQ can be used alone to get brief answers, or as a question driven index to the Chapters of the Cosmology Tutorial. Could the Universe be Smaller than it Seems? What is the Temperature of Space? What are the Giant Gas Clouds? What is the Critical Density? No one knows. We do not even know if it is finite or infinite. The question should not be confused with "how big is the observable universe?". The universe may be infinite in size, the observable universe certainly is not. The difficulty in determining whether the universe is finite or infinite is explained in Chapter 5B. But at least we can say that the universe is as large as, or larger than, the observable universe - can't we? No, sorry, even that could be wrong, as explained here. Of course, the universe is ridiculously large. Whether it is unnecessarily large is another matter. If it is necessary for a self-respecting universe to be capable of giving rise spontaneously to intelligent life, then the universe may be just large enough. But the main stream opinion these days is that the universe is not nearly large enough to give rise spontaneously to life - even once. Life, and the environment required for life, are just too improbable. It would seem to require an enormous multiverse of universes to accomplish the task. Embarassingly for astrophysicists, we have absolutely no idea what 96% of the universe is made of. The other 4% or so is ordinary stuff, like what you and I and this planet and the sun and all the other stars, and everything we can see, is made of. This ordinary stuff is composed of the three familiar particles, protons, neutrons and electrons, in a variety of forms, plus photons (particles of light) and neutrinos. The majority, 96%, cannot be seen. And I don't just mean it cannot be seen using light. It cannot be seen using radio astronomy, or ultra violet or infra red astronomy, or by gamma rays or neutrinos. So this 96% is called 'dark', and it is dark at all electromagnetic frequencies and 'dark' also with respect to all known particle emissions. The existence of this dark stuff is inferred by its effect on the motion of things we can see. It comes in two very different types: dark matter and dark energy. The description given above is the conventional wisdom at present. But be warned that there is significant room for doubt. In order to derive cosmological parameters such as the percentage of dark matter and dark energy, it is necessary to interpret observational data from the perspective of assumed theories of physics and an assumed cosmological model. An alternative to postulating dark matter is to adopt modified laws of gravity. A substantial piece of evidence in favour of the existence of dark matter has been provided recently by analysis of the Bullet Cluster. Data from Type Ia supernova studies and from the WMAP satellite have motivated belief in the existence of dark energy. However it should be understood that the observational data is interpreted from the perspective of the 'concordance model' of cosmology. Amongst other things this assumes that spacetime is of Friedmann-LeMaitre-Robinson-Walker type, controlled by a homogeneous matter density. Clearly, matter is not homogeneously distributed in the unverse on 'small' scales (i.e. on scales less than ~100 megaparsecs). One school of thought is that, in fact, there is no 'dark energy'. Instead the apparent acceleration of the expansion of the universe is an artefact of the inhomogeneous matter distribution, and is entirely explicable in terms of known physics. This is hottly contentious at present. Dark matter is simply stuff out there that cannot be seen directly. There is nothing remotely exotic in principle about the idea of dark matter. It is merely matter which does not emit light. Hence, planets would count as dark matter provided they are sufficiently far away that any reflected light to be too faint to detect. However, it seems that dark matter actually is exotic. The balance of evidence at present is that it is non-baryonic, that is, not made of neutrons and protons. So why do we think there is dark matter if we cannot see it? The answer is because the motion of the stuff we can see does not make sense otherwise. 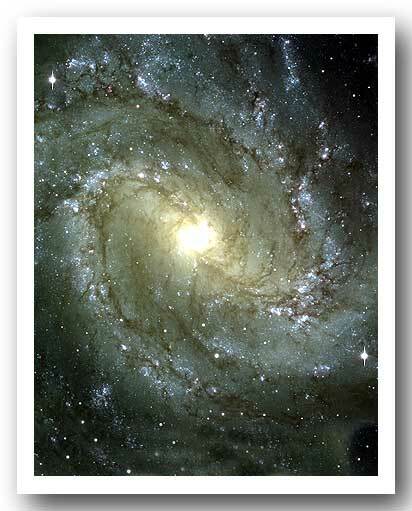 For example, consider a typical galaxy which will be rotating. A centrifugal force acts on a star due to its rotation around the centre of its galaxy. This must be balanced by the centripetal gravitational attraction of the star towards the centre of the galaxy. But it is usually the case that the observed speed of rotation is too fast to balance against the gravity arising from the mass which we can see in a typical galaxy. If the visible stuff were all there was, the galaxy should fly apart. So the hypothesis is that dark matter must exist. In addition to helping explain observed motions, the hypothesis that there is extra gravitating mass in the universe is helpful in explaining the initial gravitational collapses which brought the galaxies into being. Without this additional mass, galaxy formation is problematical. Spatial variations in the temperature of the cosmic microwave background are of the order of 1 part in 100,000. On a relevant spatial scale this implies variations in the matter density of about 1 part in 1000 at the time the universe became transparent (360,000 years after the Big Bang). This degree of deviation from a perfectly homogeneous density distribution aligns well with what is required to explain 'structure formation', i.e. the formation of galaxies and stars. However, at ~360,000 years the 1-in-1000 density fluctuations are accounted for almost entirely by dark matter, the baryonic matter fluctutaions being far smaller (closer to 1 in 100,000). The dark matter is therefore required to initiate gravitational collapse on the required timescale. Later on, the ordinary matter falls into the gravitational wells created by the dark matter to form the galaxies. Since the only evidence for dark matter is from its supposed gravitational effects, could it be that there is no dark matter at all and instead our theories of gravitation are wrong? Yes, it could. There is a respectable body of opinion that alternative gravity theories provide a preferable explanation. A more direct indication of the reality of dark matter has been provided recently by analysis of the Bullet Cluster. This has permitted the hypothesis of dark matter to be discriminated from the hypothesis of modified gravity theories. The Bullet Cluster consists to two colliding clusters of galaxies. The bulk of the ordinary matter in such clusters consists of the giant gas clouds. The constituent galaxies are the minor part of the ordinary matter. The galaxies are sufficiently sparsely distributed in the clusters that the collision of the two clusters is a minor event as far as the galaxies are concerned. The clusters pass through each other like ghosts, as regards the galaxies. However, it is different for the gas clouds. They are far more dispersed, and interact far more strongly, due to electromagnetic effects. The outcome is that whilst the clusters of galaxies have passed through each other unperturbed, and are now quite well separated, the gas clouds have 'stuck together' in the middle. The bulk of the ordinary matter has thus become separated from the galaxies (i.e. the stars). Now the location of the majority of the gravitating material can be identified via gravitational lensing. This turns out to be associated with the clusers of galaxies, now in two clearly separated lobes. Without the postulate of dark matter, this is problematical since most of the gravitation appears to emanate from the region with least (ordinary) matter. This is a blow for any theory of gravity based on ordinary, baryonic, matter as its source, even theories especially modified to account for galactic rotation curves. But the behaviour is exactly what would be expected if weakly interacting dark matter were the predominat source of gravity. This dark matter would also pass through the other cluster unaffected, and remain associated with the galaxy clusters, as opposed from the gas clouds. The current consensus is that dark matter accounts for about 22% of the total density of the universe, compared with only about 4% of ordinary matter. Apart from its gravitational effects, dark matter appears not to interact significantly with other matter. Since neutrinos, which interact only extremely weakly, must have been produced in the Big Bang in copious numbers, it is rather disappointing that they appear not to be a possible explanation for dark matter, as discussed here. So it would seem that dark matter is composed of currently unknown species of particles. Dark matter is not to be confused with dark energy. What Is Dark Energy? What Is The Cosmological Constant? What Is Quintessence? Since 1997 various studies of Type Ia supernovae have suggested that the expansion of the universe is accelerating. This was a most surprising result. The expectation was that the expansion rate would be slowing down - the only question was at what rate of deceleration? A decelerating expansion rate was expected for the same reason that you expect a stone, thrown into the air, to slow down as it gets higher. It is moving against gravity. The observed acceleration in the rate of expansion implies that there is a repulsive force at work, acting in opposition to the usual attractive gravity. There is no really substantive theory to explain these observations as yet, but both dark energy and the cosmological constant relate to potential solutions. The term 'dark energy' is little more than a catch-all name for whatever it is that is causing this anomalous acceleration. It is dark for the same reasons as dark matter: we have not seen it and infer its existence only by its affect on the motion of things we can see. Why "energy" rather than "matter"? This relates to the chief difference between its affects and those of mass. Dark energy is repulsive rather than attractive. But why should energy produce a repulsive gravitational effect? Well it doesn't - necessarily. But there is one type of energy density which does produce a repulsive gravity effect. This is often identified as being an energy of the vacuum itself: the "zero point" energy. More generally, any energy density which enters Einstein's gravitational field equations in a covariant manner and which depends on the spacetime geometry alone will be proportional to the spacetime metric tensor. In this form, dark energy is called the cosmological constant. The cosmological constant was first introduced by Einstein as a fudge to allow his gravity equations to admit a static solution for the universe. Weinberg has said that our problem is not that we take our theories too seriously but that we don't take them seriously enough. If Einstein had not been so determined to modify his equations to force them to have a static solution, he would instead have been led to predict the expansion of the universe - before it was observed. This would have ranked as his most stunning prediction from generally relativity - far more impressive than the mere bending of light or the anomalous precession of Mercury's perihelion. As it was, he missed the opportunity. No wonder he referred to the cosmological constant as his greatest blunder. It is exquisitly ironic, therefore, that it turns out that the cosmological constant may be required after all - to explain the universe's accelerating expansion. The reason why dark energy, in the form of a cosmological constant, produces a repulsive gravity is related to the fact that relativistic covariance requires its entry in the field equations to be proportional to the metric tensor. In physical terms, this means that there is not only an energy density but also a pressure associated with it. There is nothing unusual about this. For example, black body radiation has both an energy density and an associated radiation pressure. What is unusual is that, whilst the energy density is positive, the pressure is negative. This is related to the fact that the signature of the spacetime metric is Lorentzian, i.e. space and time intervals contribute with opposite signs to the invariant metric measure. Thus, the pressure of the vacuum is actually a tension. The second unusual feature is that, in general relativity, pressure acts as a source of gravity as well as mass-energy. This is a purely relativistic effect that has no counterpart in Newtonian gravity. Now a positive pressure would create an attractive gravity - but the negative pressure (or tension) of the cosmological constant produces repulsive gravity. Moreover, this repulsive effect is three times larger than the attractive gravity due to the energy density - so the repulsive effect wins. (NB: The factor of three originates from the ratio of the number of spatial dimensions to the number of time dimensions). Another hypothesis which has been offered as the source of dark energy is some form of scalar field. This would be akin to the Higgs field or the inflaton field (indeed, it would be a late-time inflaton field). Such fields can also give rise to negative pressures. The weakness of such hypotheses is that they are entirely ad hoc and have no independent corroboratory evidence. Finally, there is another potential explanation for the apparent acceleration of the cosmic expansion. It could possibly arise due to the inhomogeneous matter distribution. The attraction of this possibility is that it would require no new physics. Instead the cosmic acceleration would be a consequence of the non-linear nature of general relativistic gravity. However, it is highly contentious. The controversy over this hypothesis has rather highlighted the difficulty of interpreting general relativity. These ideas might either explain a genuine accelerating expansion, or, alternatively, they might show that there is no real acceleration after all. Instead, the apparent expansion may be the result of time dilation effects which differ from one part of the universe to another. How Could The Universe Appear To Be Bigger Than It Actually Is? In the same way as a room full of mirrors. The universe could have non-trivial topology. I believe there is no particularly complelling evidence for this at present, but it continues to be a possibility. Go to top of page What is the Temperature of Space? What are the Giant Gas Clouds? Don't be silly, space does not have a temperature. Temperature is a property of matter, whereas space is a geometrical arena within which events take place. What, you think I'm being unhelpful and excessively pedantic? What you really wanted to know was, "what is the temperature of the stuff in space?". Ah...but what stuff? The idea that all interstellar space is much the same is grossly wrong. True, it is all dominated by hydrogen (~75%) and helium (~25%), in some form or another. But even if attention is restricted to the space within a single galaxy, gas clouds with a huge range of different densities and temperatures occur. Probably the only simple statement that can be made about the temperature of "space" is that it is never less than 2.728K, since this is the temperature of the cosmic microwave background. [Temperatures below 2.728K have only ever occurred, anywhere in the universe at any time, in the laboratories of low temperature physicists on the planet Earth]. The interstellar gas clouds are big, perhaps hundreds of light years across. Despite their extremely tenuous densities, their masses are of the order of billions of solar masses, i.e. around 1% of a galactic mass. Ignoring the helium component for simplicity, they may consist of molecular hydrogen, atomic hydrogen, or ionised hydrogen (i.e. a plasma of protons and electrons), in order of increasing temperature and decreasing density. The temperature of the molecular clouds is very low, perhaps around 10K, and their density is typically 300 molecules per cm^3. These are the gas clouds from which new stars are made. Clouds of neutral atomic hydrogen come in two forms: cold and "warm". The cold neutral clouds are at 50-100K with particle densities of perhaps 50 /cm^3. The "warm" neutral clouds are at a temperature of ~8,000K, and so are very warm indeed, with particle densities rather less than 1 /cm^3. Clouds of ionized hydrogen also occur in two types, "warm" and hot. The "warm" ionized clouds have densities and temperatures similar to those of the "warm" neutral clouds. The hot ionized clouds reach temperatures of an impressive half-million or so K. Their densities are correspondingly low, around 0.003 per cm^3 (3000 /m^3). Note that all these gas clouds are so tenuous that they would constitute record breaking vacuums on earth, by many orders of magnitude (the best achievable vacuum in the laboratory being around 10^8 /cm^3). Nevertheless, their densities are very large compared with the critical density. The above refers to gas clouds within a galaxy. What about the space between galaxies? Again this comes in different forms. The space between galaxies within a local cluster may be expected to be very different from the space between clusters within a given supercluster. And these will be different again from the desert voids which comprise the majority of the volume of the universe. The density of these extra-galactic regions is so prodigously low that they bring down the average density of the ordinary (baryonic) matter of the universe to a mere 4% of the critical density. So, how would you answer the question, "what is the temperature of space?" Assume for a moment that the cosmological constant were zero. The critical density is the density of a homogeneous universe which would be just sufficient to halt its expansion (eventually). A universe with a lower density would expand forever. This is referred to as an open universe and has negative curvature and infinite volume. A universe with a density greater than the critical density would stop expanding at some finite time. It would subsequently contract, heading towards a Big Crunch. This is referred to as a closed universe and has positive curvature and a finite volume. The critical density therefore plays the same sort of role for the universe as the concept of "escape velocity". The delicately balanced intermediate case, when the mean density exactly equals the critical density, goes on expanding forever but at a speed which is reducing asymptotically towards zero. This is a flat universe with zero curvature and infinite volume. It is important to realise that the critical density is not constant but decreases with time. Numerically it equals 3/8*pi*G*t^2. Because of the expansion of the universe, its mean density also decreases as 1/t^2. Consequently the ratio of the density to the critical density is a constant (generally denoted by Omega), at least it has been constant since the universe became matter dominated at around 50,000 years. At the present epoch (t = 13.7 billion years) the critical density is 5.7 hydrogen atoms per cubic metre. Compare this with the highest vacuum achieved in terrestrial laboratories (~10^14 molecules/m^3). Nevertheless, this prodigously low density is sufficient to halt the expansion of the universe through its gravitational effect. If the cosmological constant is non-zero and positive, as it is now believed to be, then the simple identification of positive curvature (rho > rho_crit) with a universe which re-contracts no longer holds. On the contrary, at sufficiently late times its rate of expansion will increase exponentially. Similarly, a universe with a negative cosmological constant and negative curvature (rho < rho_crit) would not expand forever but would re-contract, though this case does not appear to represent our universe.